The 14U Dallas Tigers came into the PG Super25 North Texas Regional hungry for a tournament win. In game one of bracket play, Jared Thomas threw a gem for the Tigers, allowing zero runs and besting D-BAT Elite by a score of 8-0. He allowed five hits and zero runs over six innings, striking out three and walking zero. Hot on the offensive side for the Tigers were Josh Hoover and Trenton Shaw who both homered in the game. Jacob Devenny, Jared Thomas, and Walker Polk all hit doubles as well. Game two was a meeting with Dulins Dodgers Prime. In a one run game, Owen Peck drove in Caleb Bergman from second to tie it up at two. Then with the game tied in the bottom of the fifth, Dallas Tiger Jayson Jones does what he does and delivered a clutch hit for the go-ahead run to make the score 3-2. Trenton Shaw started on the mound allowing only 1 hit. Josh Hoover came on in relief and surrendered an impressive zero runs on one hit over four innings, striking out three. 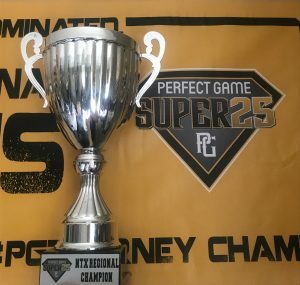 In the PG Super25 championship game, the Dallas Tigers wrangled victory 8-7 from Twelve Black after a back-and-forth game. The Tigers tallied 11 hits in the high scoring affair. Trenton Shaw, Josh Hoover, Caleb Bergman, and Owen Peck each collected multiple hits. Jayson Jones had two RBIs while Jaxon Haynes and Walker Polk each collected one RBI. The Dallas Tigers pitchers battled it out on the mound against a strong offensive team in Twelve Black. Zion Bell started on the mound and Tommy Delaney threw two innings in relief out of the bullpen. Josh Hoover took the win for the Tigers. He went one inning, allowing zero runs on two hits, striking out one and walking zero.